Last weekend I managed to leave South Africa four times and enter it three times. I managed to arrive in the US over two days’ late for my latest visit. I’ve never before managed to leave and enter South Africa more than once in a day, and my longest air travel delay wasn’t much more than a piffling 30 hours. All I needed to help me achieve this new personal travel high-water mark was the dedicated help of two airlines. But, hey, that’s what friends are for! I’m a bit sour about the fact that my luggage actually managed to upstage me. Not only did it enter and leave South Africa as often as I did, but it managed to take an extra two days to reach its destination – which was me, of course. This seems a most unfair sort of oneupmanship. But there it is. Another interesting feature of my achievement is that I didn’t plan it at all. Admittedly I had been practicing for the record attempt: on my previous trip to the US in April; my flight had been delayed by a day. But I only left South Africa once and my suitcase tagged along (pun intended), so I was hardly in training at all for this successful record attempt. This, I claim, makes the achievement even more noteworthy. Anyone can be successful as a result of practice, planning, and hard work, but how many people can do it entirely by bad luck? This makes me very proud, but I’m still irritated by the behavior of my suitcase. It happened like this. I arrived at Johannesburg’s OR Tambo International Airport (ORT to its regular visitors) all set for my trip - a flight to London followed some hours later by a connection to Newark. 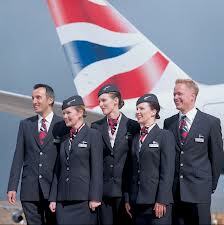 All this was to take place on British Airways (the self-proclaimed “World’s favorite airline”). What could be more straightforward? I checked in my suitcase, cleared security, and left South Africa through passport control. Now a few hours in the lounge were all that separated me from my flight with a (relatively) comfortable exit row seat. Or was it? Apparently there was “a short delay”. The short delay became longer. The passengers became restless; hardly surprising since ORT has decided it’s unnecessary to have seating in all the departure lounges. After all, exercise is good for you, so why shouldn’t the passengers hop from leg to leg for two days while they wait for their flight to depart? A charming lady came round and told passengers individually in a low voice about the delay. This was a clever move because making an announcement to ALL the passengers would certainly have upset them. Whereas standing in the lounge with no information as the flight time receded into the past by hours wouldn’t cause them real concern. I gave up and went back to the lounge. There we heard that “the Captain is talking to London”. This was said in hushed tones, partly to avoid upsetting the other passengers by giving them information, and partly because that's the way you enunciate revelations between the prophets and their God. Eventually, at around 11PM, the flight was officially “delayed” – to 7PM the next night. I reentered South Africa, collected my luggage, went through customs and persuaded a kindly taxi driver to take me home in exchange for every cent I had. I drifted off to sleep at 1AM thinking that, after all, the safety of the plane was paramount. I think the safety of the plane was involved. I had been (privately) informed that a part had to be flown out from London. Presumably as a result of the Captain’s call to God. So on Sunday I arrived in good time, checked in my bag, went through security and on to the lounge. The same staff were on duty. One look at their faces caused my heart to sink. These were not happy airline employees readying for a pleasant flight to London. These were harried and miserable people fearful of becoming shot messengers. Yes, the part had arrived. Some problems remained. No, they didn’t know when the flight would depart or if it would depart at all. Would I like a glass of champagne while I waited? Around 11PM the decision was made to call off the flight. It would be replaced by a flight in a different aircraft the next day at 11AM. At this point, I broke a glass of champagne on the table. It was an accident. Honestly. But as I was heading back to passport control to collect my suitcase and head for a scalper taxi, my cell phone rang with excellent news. Air France had a seat available on their flight to Paris! And it would connect with a Delta flight to Newark! (Delta is guiltless in this story; it is only mentioned here for completeness.) I was to rush to collect my bag, get transfer documents from the BA transfer desk, check in to Air France and rush back through Passport control to board the plane. 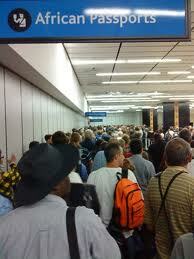 I did all this in record time, entering South Africa and leaving it again in a matter of minutes. There were a few niggling doubts. Why was the Air France plane waiting to leave after midnight? Their flight usually leaves in the early evening. Apparently the air traffic controllers were striking about something or other in Paris. I had mixed feelings. That explained the lateness of the flight, but what about possible delays in Paris causing me to miss my connection to Newark? I shrugged it off. I was completely right to shrug it off. We had absolutely no trouble with the Paris air traffic controllers. We never got anywhere near them. After I'd been sitting on the plane for an hour, the captain announced that the flight was cancelled due to an electrical problem. Actually he told us this in French followed by a broken English translation, but I'd already picked up the drift from the multiple use of the wonderfully descriptive French word “désolé” in his announcement. The plane manager then asked us to remain seated. This seemed excessively cautious since the plane was still at the gate and the engines weren’t running. Anyway, no one took any notice. 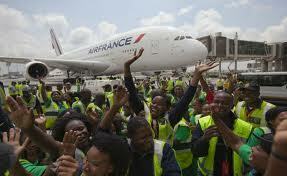 Air France now had 500 people on a packed Airbus 380 to accommodate for the night. We got to bed at 5am. At 7am I woke to contact BA to make sure that I was booked on the Newark flight on Tuesday since the 11am departure meant that I would have to spend the night in London. I made a careful arrangement with a helpful lady who actually did nothing about it. 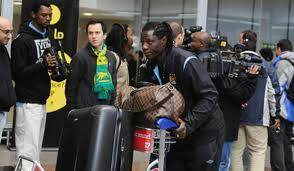 Then I headed for ORT to check in, go through security, leave South Africa and fly to London. There I was separated from my luggage. It seemed there was a baggage handling problem. No matter, it would be transferred to the Newark flight "automatically". There would be no problem. The bag caught up with me two days later. Overall, I’m satisfied with my performance. Not only did I achieve a new personal record for delayed air travel, but I didn’t lose my temper and scream at any of the staff who were doing their very best provided we didn’t want any information. There was the matter of the broken glass of champagne, but that was an accident. Really. Oh, Michael, that you can make this story hilarious tells all one needs to know about your being a champion of a human being. I award you the Croix du Teatre Absurde and the British Stiff Upper Lip Medal of Honor for this your personal best of the best. I suggested after the first incident that Michael take the boat, but he didn't listen! What can I say? You're far too kind to Delta. I believe they have plastic champagne glasses in their lounges to avoid just such "accidents"... propelled against the walls. Jeff, thanks for your comment. But I must stress again that if the glass hit the wall, it was completely by mistake. I'll think about taking a boat back. I guess I can find one in Florida? Thanks for the accolades, Lisa and Annamaria. What can I say? I deserve them!